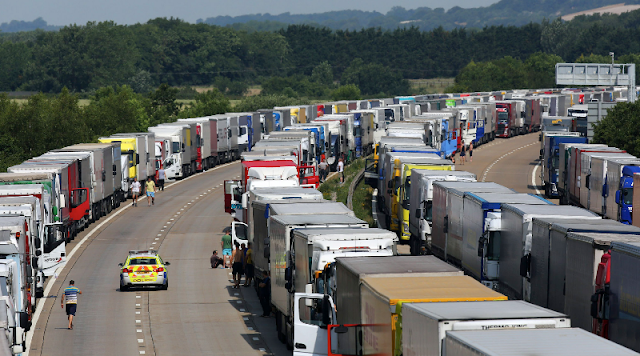 Could food, medicines and petrol run out in the event of a no deal scenario? The short answer is yes, absolutely. It only takes a small disruption to sophisticated supply chains for things to grind to a halt. Leaving the EU without a deal means becoming a third country overnight. The status of having no formal trade relations. The UK would not exist as an entity anywhere inside the EU legal framework. We would be subject to third country customs controls without any of the single market product approvals or valid certification. If you don't have the valid paperwork for your goods to circulate freely in the market then you have to find a named importer and have your products re-certified inside the EU - at considerable cost. Some classes of foodstuffs must be diverted to border inspection posts. So that means if we go from single market members to being a third country then overnight the ports back up, Operation Stack goes into effect and lorries are sat on the motorway for days. That takes trucks and drivers out of circulation. The normal flow of supply chains is interrupted. Remember this works both ways for trucks coming in and out of the country. Meanwhile companies by law have to file declarations which our current system is not designed to cope with. For some suppliers there will be no point in trucks even leaving the depot. With roads jammed with trucks, supply chains collapsing very rapidly we see rumours of shortages which leads to panic buying. It happens every time we get even a dusting of snow where Tescos run out of bread and loo roll even if there is no actual shortage. Those of you old enough to remember the fuel strikes will remember how perilously close the country came to grinding to a complete halt. This would be the same with fuel lorries trapped in traffic. The way the EU legal system works is that if there is no paperwork and there's no tick in the box then there is no trade. All the while keep in mind that we will have been ejected from the treaty system governing airways and flight-plans, and without legally valid flight-plans then aircraft are grounded. All rights in the EU airline market are rescinded. There is nothing in WTO rules that compels the EU to breach its own rules even in an emergency. Driving licences wouldn't be valid, nor would qualifications so there would be no mutual recognition of conformity assessment. Veterinary inspectors, drivers and pilots would be disqualified. This is not "remoaner" speculation. Our own findings at The Leave Alliance paint a pretty grim picture of the WTO Option. This is a simple matter of law. If we have no formal relations with the EU then trade simply does not happen. Longer term, as a third country, the costs of delays, inspections and re-registration make UK business uncompetitive in the EU. Costs go up, contracts are lost, deadlines are missed, tariffs kick in. This is what it means to be outside the European Economic Area. All of this has been made clear in the EU's Notices to Stakeholders. These are formal notifications based on the current law. This is no scaremongering or diplomatic threat. This is the business end of the EU. We don't know how long it would take to get the trucks rolling again. We'd have to revert to paper declarations because the current IT is not set to cope with the volumes of declarations nor is it mapped to a third country regime. There are mid term fixes in the form of bilateral agreements but these would take time and since the UK will have left without paying, the EU would not be in a rush to do us any favours. It will take years to rebuild a functioning customs and regulatory system. In the meantime businesses cannot afford to wait. Suppliers to EU assembly lines will have no choice but to relocate. Delays will naturally mean production slowdowns and all the secondary suppliers will take the hit. Trade is more than just movement of goods and there are far bigger worries than tariffs. By leaving without a deal all the otherwise manageable problems of exit happen overnight without the capacity to cope with them. We would be in very serious trouble. Frictionless trade does not happen by accident. It is the product of thirty years of technical and regulatory collaboration and the result of several strands of agreements on everything from fishing to aviation. Without formal status in the system then UK trade collapses. Additionally, it's not just the immediate effects we must consider. It's the ripple effect that passes through every supply chain, every regulatory system and anything that depends on licencing, certification and approvals. Nearly all of it has an EU dimension. Without alternative arrangements a lot of our insurances become invalid, contracts voided and work will grind to a halt an major infrastructure programmes. It will simply be illegal to operate without valid insurances. So deep and comprehensive is EU integration that there is no escaping the regulatory gravity of the EU without serious and lasting harm. It is therefore not remotely realistic to suggest that things can function without a formal framework for trade. Leaving without a deal simply is not an option.